Miss Bess E. Kratzer of Mansfield, PA and Guy Day of Mansfield, PA married November 27, 1915 at Horseheads, N.Y. by Rev. Merritt Soper. Mr. Theodore F. Bardwell of Troy, PA and Mrs. Barbara E. Allen (previously married to Leon Delos Hoagland and John W. Kratzer) of Mansfield, PA were married at his home near Troy, January 1, 1915 by Merritt Soper, Minister of the Gospel. Witness: Bessie and Pansy Kratzer; Geo. Bardwell and wife Ella; Mrs. Geo. Gardiner and Guy Day. George Scarfe left London, England for America arriving in New York in March 1869 followed by his wife and son, Geo. Jr. aged 2 ½, in June of same year. 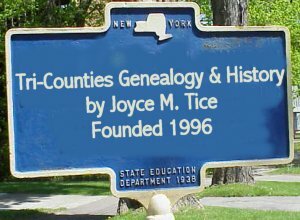 They lived in Brooklyn, NY until Feb. 1870 when they removed to Mansfield, Tioga County, PA.
Geo. Scarfe Junior left Towanda, PA and settled with his wife and family of 5 children in California in July 1900. Marion Hilda Scarfe, of Mansfield Tioga County PA to Frank C. Lounsberry of Canoe Camp Jan. 3rd 1894 at State Line, NY by Rev. W.L. John of Elmira. Charles Henry Scarfe of Mansfield, Tioga County to Miss Martha Everts of Covington, PA June 2nd 1897.